It all started with bacon and buckwheat pancakes. Two foods we never had around the house unless we’d been packing for a weekend camping trip to Yellowstone National Park. But one Sunday morning I woke to the sticky-sweet smell of sizzling pig fat and wandered downstairs to investigate. I have a theory that men approaching 50 often turn to ultrarunning as a way of coping with impending midlife crises. The summer I returned home for a few months of table bussing and long, rambling hikes in the Bitterroots of Western Montana was the same summer that my old man started running. Every weekend he’d get up at dawn, lace up a pair of mud-caked Brooks, and head out the back door for a few hours of mountain running with the motley members of Missoula’s nascent trail running community. Having never run a step in my life at that point (save for a very brief experiment with middle-school track which isn’t worth recalling), I was nonetheless intrigued by my father’s weekend adventures and I bombarded him with questions as he whisked eggs and flour into a bubbly batter. Where had he been? What had he seen? Who had he been with? Where was he going next week? A year later, Pa ran his first 50-miler and I watched the stats roll in from an office in New York City where I’d been living at the time, silently cheering as he crossed the Bighorn 50 finish line in little Dayton, Wyoming. I learned later that he’d puked up a lovely green splatter of Perpetuum and PBR on the way home, but he’d had a blast. Kept going on about the watermelon and salt at the Dry Fork Aid Station, and the beauty of the trails. I’d started running by then, but only short bursts of aggressive pavement pounding in Central Park, and the idea of tackling such a distance seemed inconceivable at the time. But the more stories he returned with, the more I secretly wanted to run trails, too, though it would be another year before I finally worked up the courage to ask him to let me tag along. “Kevin [Twidwell] and I are going to run a big loop in the Rattlesnake this morning. There’s a nice spot seven miles in where you can turn around for a 14-mile out-and-back. Just see how you feel,” he said, in a tone of amused concern. “Sure, dad.” Oddly enough, at the allotted turn-around point, I felt great. And with the stubborn determination of a neophyte runner, I told him I wanted to keep going. We didn’t run fast, but we saw a bear, flushed some grouse, climbed a peak, bombed a decent, and took photographs from the lookout on top of Blue Point, stumbling back to the car some 30 miles later. By the next day, my quads felt as if they’d been shredded with a cheese grater, but running trails turned out to be everything I imagined it might be. Pa laughed as he recapped the day for the rest of the family over dinner. Steve Brown after finishing the Cascade Crest 100. Now when I go home, Pa and I both get up at dawn. We lace up our matching Brooks and meet the boys at the Rattlesnake trailhead for a Sunday morning run. And, later, we’ll cook buckwheat pancakes and talk about our friends who are fast and races we’d like to run and trails we still want to visit. And after a point, those days together become less about running and more about simply spending a day together. In fact, the more folks I talk to, the more it seems like most of us were inspired to run by taking cues from someone else. Crewing a friend, volunteering at and aid station, pacing a few miles of a 100 by the annular glow of a Black Diamond headlamp, scrolling through pictures on Facebook, and listening to the stories. As far as I can tell, it’s not entirely the competition or the occasional midlife crisis that impels us to run. It’s something more basic. The camaraderie of experience. 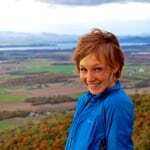 Meaghen Brown is an assistant editor at Outside Magazine and amateur trail runner. Her work has appeared in Outside, The New Yorker online, The Santa Fe Reporter, and The Atlantic online. When not at her desk, you'll likely find Meaghen getting lost on exploring trails around Santa Fe, New Mexico. Her proudest running accomplishment to date? Beating Nikki Kimball's course record at the Blue Mountain 30k. She claims to owe it all to one yurt dweller and three crazy lawyers from Missoula, Montana. As a dad, I loved reading this. I really hope one or both of my daughters will someday start running trails with me like Meaghen does with Steve. Maybe i need to start cooking bacon and pancakes for them as an incentive. Nice story, M.
Awesome story. It bears mentioning that your dad is pretty darn fast for a middle aged lawyer. Also, speaking of middle aged lawyers, I'm impressed that you continued running after spending a day on the trail with Kevin — not at all deterred by the scene. :-) (Joking of course). Lately I've had the pleasure of running with your dad and Kevin T. whom I met through Doug Maves. Truly a pleasure and inspiring to say the least. Great article. Heard a lot about you, hope to meet you soon as well. i hope someday i have such experiences with my son! i finished reading your piece and added, quite without intention, "…and a river runs through it." Great story, lovely writing. Thanks for letting us in on your pa's secret weapon. Bacon is on my grocery list from now on.